Propolis, a resin produced by A. mellifera bees, presents several compounds of pharmaceutical interest and, further studies to demonstrate their pharmacological actions is sought. Capsules containing green propolis (BRPX) extracted in flax oil (1 and 2) polyethylene glycol (PEG) (3 and 4) were analyzed and analyzed according to IN 31. The following parameters were evaluated: total phenols and flavonoids, quantification of Artepillin-C (HPLC) confirmed by UHPLC-MS, antitumor activity in MCF-7 (breast code 0162) and B16F10 (melanoma code 0046) and antimicrobial activity (E.coli, C. albicans and S .aureus). The flavonoid content (%) of each capsule was 1: 1.135 ± 0.009, 2: 0.521 ± 0.039, 3: 0.758 ± 0.020, 4: 1.232 ± 0.09. The phenol content (%) of 1: 2,509 ± 0,024, 2: 2,280 ± 0,075, 3: 1,039 ± 0,029, 4: 3,426 ± 0,074. The content of Artepillin-C (mg / capsule) of 1: 1.39 ± 0.12, 2: 1.07 ± 0.05, 3: 0.66 ± 0.01, 4: 0.39 ± 0, 01. The IC50 (μg / mL) for MCF-7 was: 1: 100.49 ± 6.41, 2: 463.65 ± 0.71, 3: 209.03 ± 35.99, 4: 238.84 ± 4 , 16 and for B16F10, 1: 277.53 ± 7.37, 2: 357.48 ± 10.15, 3: 376.15 ± 5.92, 4: 286.87 ± 10.79. Inhibition halos ranged from 10 to 14 mm (E.coli), 8 to 10 mm (C. albicans) and 8 to 9 mm (S.aureus). This study demonstrates the importance of quality control for reliable formulations based on propolis. 1. BRASIL (2001). MINISTRY OF AGRICULTURE. Normative Instruction nº 3 - ANNEX VII - Technical regulation for determination of identity and quality of propolis. Diário Oficial da República Federativa do Brasil. ISNAD DOS SANTOS, G.A. , LAGAREIRO NETTO, A.A. , MENDES, P.B. , NEGRÃO, V. , MARCUCCI, M.C. , DINIZ, S.N. , CARNEIRO, M.J. , SAWAYA, A.C.H.F. . "Formulations Containing Propolis of Apis mellifera with Antibacterial and Antitumoral Activity". 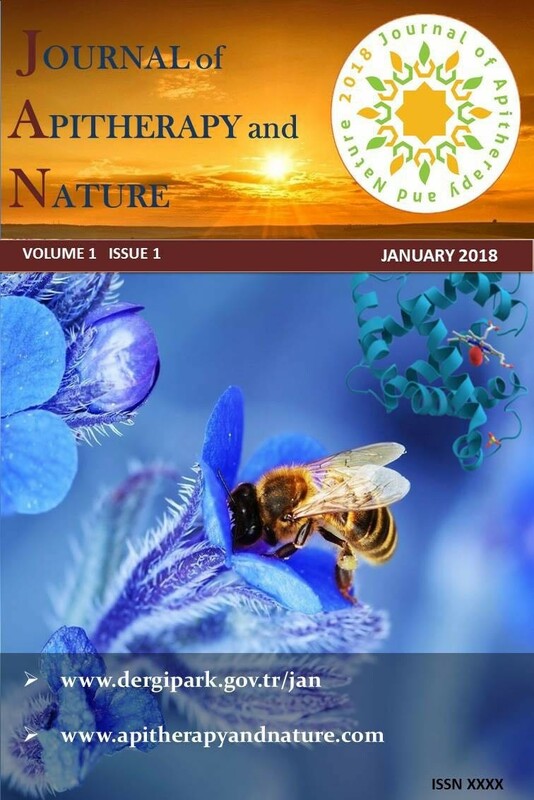 Journal of Apitherapy and Nature 1 / 3 (December 2018): 68-68.